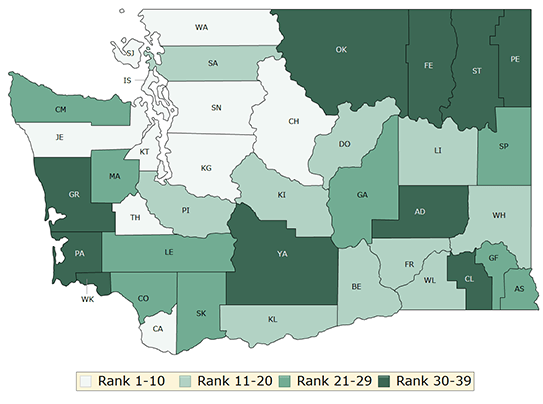 The recently released 2018 County Health Rankings Report: Washington reveals significant health disparities across the state. The report analyzed health outcomes and health factors to determine a county’s ranking. Counties had similar rankings for both categories, generally falling within the same quartile. Ferry County was ranked the lowest for both categories, while King, San Juan and Snohomish Counties had the top three rankings in both categories. According to the report, health outcomes “represent measures of how long people live and how healthy people feel.” Health outcomes take into account premature death, quality of life and the percentage of low birth weight newborns. 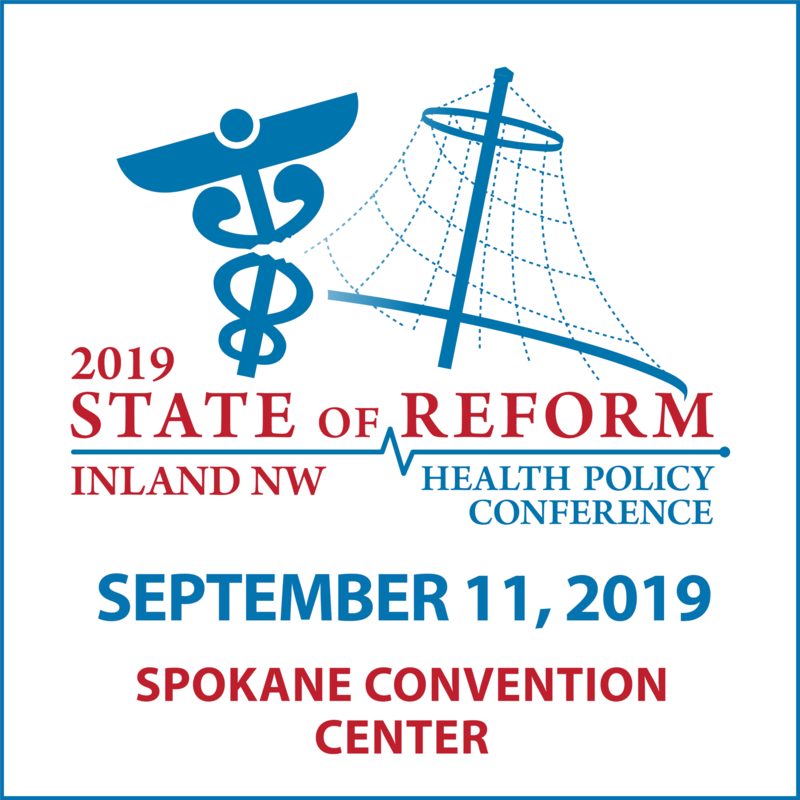 In Washington, the counties with the best health outcomes are generally centered around the Puget Sound, with health outcomes getting worse farther out from the Puget Sound. 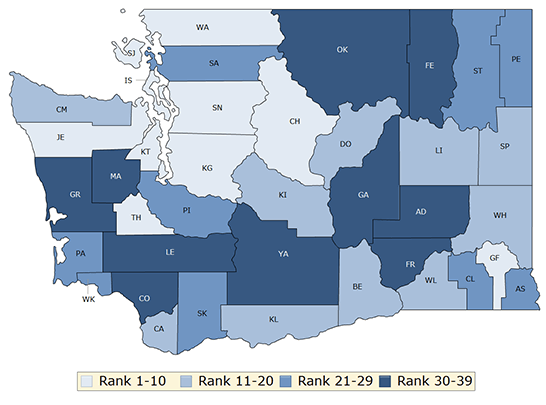 While Washington State as a whole has either better or equal health outcomes compared to the national average, the lowest ranked counties in the state have worse health outcomes in all five areas measured. The map ranking health factors in the state is similar to health outcomes, with nine of the ten the top ranked counties centered around the Puget Sound region. In addition to health behavioral, social and economic factors and the physical environment, the report reveals significant disparities in access to care. These disparities are true for other areas such as adult obesity (20% vs. 36%), access to exercise opportunities (12% vs. 98%), unemployment (3.9% vs. 10.8%), and children in poverty (9% vs. 28%). 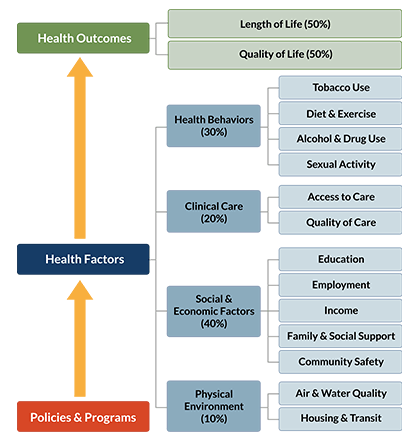 In order to improve health equity, the report outlines four main strategies. Invest in education from early childhood through adulthood to boost employment and career prospects. Increase or supplement income and support asset development in low income households. Ensure that everyone has adequate, affordable health care coverage and receives culturally competent services and care. Foster social connections within communities and cultivate empowered and civically engaged youth. Additional data can be viewed here. Note: We included which ACH each county belong to as another point of comparison.